If you thought cupcakes couldn't get more exciting or delicious, then think again. Here, the classic cupcake meets lavender, which is just the perfect flavoring to make your cakes sing. Couple that with a dash of heady vanilla extract and you are onto a winner, for sure. This classic lavender and vanilla cupcake recipe may soon become a favorite in your baking repertoire. 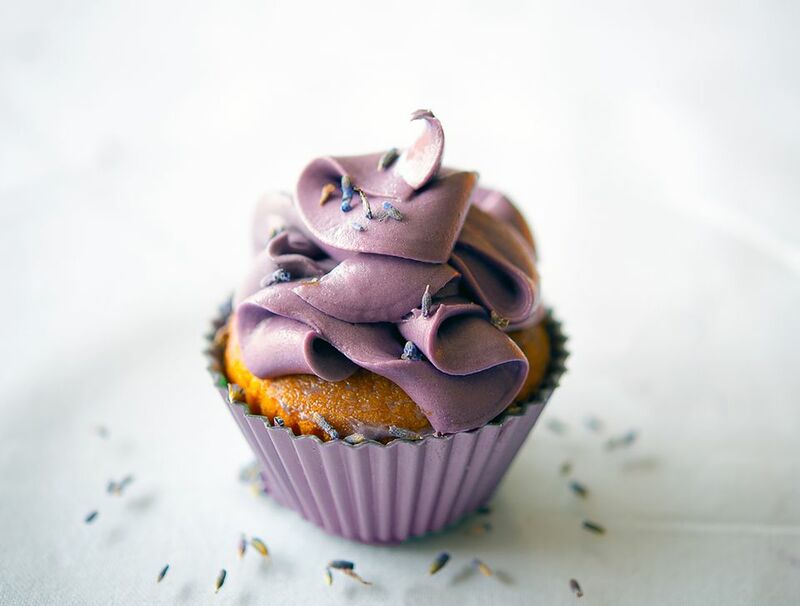 But a gentle warning: while lavender makes a super addition to so many dishes, and is so perfect added to a cupcake, one should use it with caution. By adding even a touch too much of lavender, you will swamp the cakes with its heavy scent. In this case, less is always more. Line each cup of a 12-hole muffin tin with a cupcake insert. Put all the cake ingredients except the lavender in either a stand mixer or baking bowl, and beat together to create a lovely smooth cake batter. Add the lavender and stir again. As carefully as you can, divide the mixture evenly between the cupcake inserts. Using the back of a teaspoon, ever so gently, smooth the surface of the mixture. This is to assist in having evenly sized cakes. Pop into the middle shelf of the oven and bake for 20 minutes until risen and golden brown.­ Remove from the oven and leave to cool for 5 minutes, then take each cake from the tin and leave to cool completely on a wire cooling rack. Put the butter, the vanilla, and milk in a large bowl. Sift in half the sugar and a few drops of lavender food coloring - only add a little. You can always add more if needed. Beat fiercely with a wooden spoon to create a light, airy cream. Continue beating as you add the remaining sugar and a few tablespoons of milk if the mixture becomes too dry. Once the cupcakes are cold, it is time to be as artistic as you desire. Using a piping bag, pipe the buttercream onto the cakes in swirls, twists, ribbons, or however you wish. Finish with a sprinkling of culinary lavender. The cakes will only keep for a day when stored in an airtight tin, so best eat them as soon as you can. The pairing of lavender with vanilla is a classic of the culinary world, but that does not mean you cannot make a few changes. Add a little squeeze of lemon juice to the cake mixture and you may be surprised at how delicious the finished cakes.